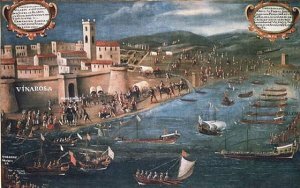 Expulsion of the Moriscos from Viranos. In an effort to rectify a historic injustice Spain is offering Sephardic descendants of Andalusian Jews who were forced to adopt Christianity, tortured and or expelled by King Ferdinand and Queen Isabella automatic citizenship. One has to wonder if Spain’s recognition of its historic injustice will also extend to Maghrebian descendants of Andalusian Muslims who faced a similar inquisition and expulsion? Imagine the uproar if they were also included, cries of Islamization, creeping Shariah and dhimmitude would ring out far and wide in the looniverse. MADRID — The conferring of Spanish citizenship to Sephardic Jews will be automatic and independent of the government’s discretion, the country’s justice minister told a delegation of American Jews. According to my father base on his family tree my great grandfather is a Spaniard that came from Spain 1840 with a surname of pastoral. I JUST WANT to know if my great grandfather belongs to the Sephardic Jewish group…..kindly assist me regarding this matter…I still have the family tree that my father gave me with the complete name of my great grandfather . thank you very much…. And also in Sarajevo, Saloniki and Istanbul there never was a Jewish ghetto. Jews could settle wherever it pleased them and where they could afford it. That’s right. Nevertheless the Almohads brought back some of the culture and lifestyle of Al Andalus to Morocco. Some of the greatest architectural monuments in Morocco are from the time of the Almohad dynasty. As I have so often said, teh genocidal greater Serb anti-Nosnisak crusade is an attempt to do the same thing the Chrisitian kings of Spain did during the Reconquista. I can only say: learn the history and the demise of Al Andalus. Do not repeat their mistakes. Be prepared to repel any aggression, or you will share the fate of the Spanish Muslims. The Spanish Muslims, being Arabic speakers, could settle in North Africa. but at first they weren’t welcomed at all. Over the centuries, and with hard struggle, they could somehow rebuild their shattered lives. The Bosniaks have no such alternative, and also Bosnia is their homeland. So yes, the history of Al Andalus, along with songs and literature of that era, should be taught in class to Bosniak schoolchildren. So that they see the parallels and draw their own conclusions. And if that means that they must live as the Spartans did, keeping their military uniforms, weapons and equipment in their closets and knowing they can be called to action any time, to return “with the shield or on the shield” then so be it. Well the Almohads as well as the earlier Almohavids (who weren’t quite as bad, despite being the villains in El Cid) were North African fundamentalists, and they didn’t really get on well with the more liberal Andalusians. What really doomed al-Andalus was the al-Mansur dictatorship, which disarmed its own people and relied on foreign mercenaries (Christians and Africans) in order to maintain itself in power. Al-Mansur also launched deep raids into the Christian kingdoms to the north (far worse than under earlier rulers) in order to distract the people from his misrule at home, which created a strong desire for revenge among those Christians (just as the persecution of Christians by Fatimid “Mad Caliph” Hakim was used as a pretext for the Crusades). By that logic though, the explusion of the Jews could also be justified on the grounds that they were fifth columnists who had helped the Muslims conquer Spain in the first place. Before the Celtiberians, Romans, Gauls, or Visigoths reached the Mediterranean coast of Iberia from the Northeast, and before the Arabs ever reached the opposing shore, both sides of the Straits of Gibraltar were inhabited by Carthaginians and people akin to them. I don’t doubt they’ve left their physical and genetic imprint to this day. People still more ancient than these were there. Remains of a man who died in Spain some seven or eight millenia ago have yielded to genetic analysis: he was dark-skinned, black-haired…and blue-eyed. I knew two people of Andalusian descent, father and daughter, similarly swarthy and light-eyed, and in the aftermath of the Libyan tragedy, a picture was published of a dark-skinned young man surveying the desolation,his eyes reflecting the blue Saharan sky. The Indo-Europeans and the Arabs both are aftercomers. All of us stand above peoples now forgotten: on their shoulders and on their graves alike. Thanks for the upvote, Garibaldi. keep up the good work; hope I can win your approval more often. Yes I have! The Balkan Muslism are not “invaders”! Bosnia-Herzegovina is their homeland! Nobody has a right to expel them from it, nor to oppress them! So you stand for genocide against Bosniaks? For Greater Serbia? Because you mean nothing else by “liberation of the Balkans”! Damn you!